Our Service Department is critical to our success. We are an Authorized Service Facility for Canon and our technicians have been certified by Hewlett Packard. 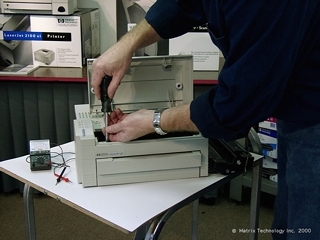 LaserScript technicians can service, repair, and clean all HP LaserJet printers and all Canon personal copiers. We have experienced certfied techinicans for HP laserJet printers and Canon PC copiers. Our rates are very affordable. No work is performed without your knowing the cost of the repair. Twenty four years of service to the Maryland Area. I live in Ellicott City and work in Arlington, VA and for years now I have been bringing all of our office printers to you for maintenance and repair. I know I get reliable service, using quality parts and your staff is top-notch in all aspects. After all these years of great service I figured it was time I thanked all of you at Laserscript for a job well done! * Fix it right the first time!